Trump’s national energy and climate action plans run contrary to those of the large majority of Americans, however; at least according to a survey conducted by the non-partisan Pew Research Center. Just shy of two-thirds of Americans (65%) give priority to developing alternative energy sources as opposed to 27 percent who favor expanding fossil fuel production, Pew’s Brian Kennedy highlights in a Jan. 23 news post. Pew’s latest survey results show that support for developing alternative energy sources has gained ground among Americans in recent years. 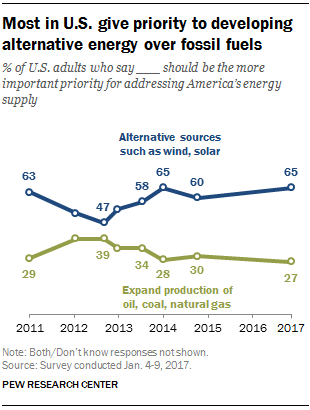 Six in 10 Americans said developing alternative energy sources was a higher priority than expanding fossil fuel production in Pew’s Dec. 2014 survey. Pew’s latest survey also reveals that support for alternative energy development is much higher among Democrats than Republicans. Eight in 10 Democrats and independents who lean Democratic Party (81%) said they favor development of alternative energy sources as opposed to fossil fuels. The corresponding figure for Republicans and independents who lean Republican was 45 percent. Forty-four percent said they favored expanding production of oil, coal and natural gas. Drilling down, Pew researchers found that 65 percent of liberal Republicans and those who lean Republican place higher priority on development of alternative energy sources. That drops to 33 percent among conservative Republicans and independents who lean Republican. In sharp contrast, nearly 9 in 10 liberal Democrats (88%) and 77 percent of moderate and conservative Democrats prioritize alternative energy development. Turning to age groups, Pew’s latest survey reveals that younger Americans (18-49) are especially likely to support prioritizing alternative energy resource development. More than 7 in 10 (73%) said developing alternative energy sources should be a national priority as compared to 22 percent who said expanding fossil fuel production should be a priority. 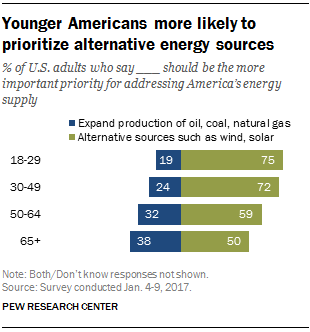 In addition, 55 percent of Americans 50 and older said alternative energy development is more important than expanding fossil fuel production. One-third (34%) said expanding fossil fuel production should be a higher priority. Trump won the 2016 presidential election, but he actually lost the popular vote, and by the greatest margin in U.S. history. Nearly 3 million more Americans (2.8 million) voted for Democratic Party candidate Hillary Clinton. That’s a losing margin five times that of any other President in U.S. history. The second highest popular vote deficit occurred in 2000 when George W. Bush was elected president as a result of the Electoral College system. Trump’s election and his initial actions regarding U.S. climate change and energy policy once again demonstrate that popular mandate isn’t required when it comes to governing and leading the nation. 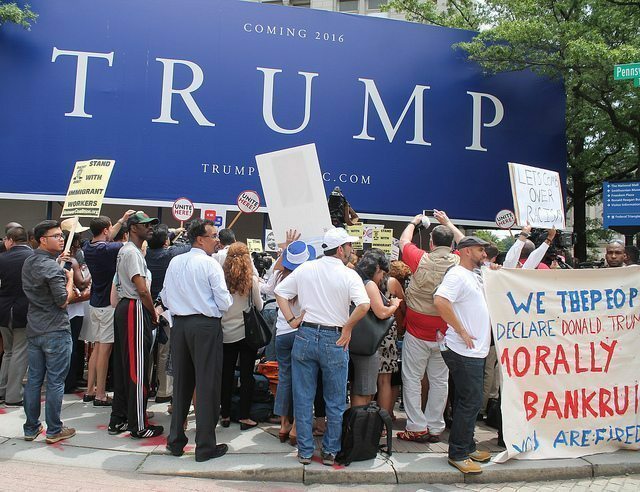 With so many opposed to his policies and his combative style, U.S. society faces four long four years of divisive, internecine political battles. Hunker down now.